Cover pencils by Curt Swan, inks by Murphy Anderson. "The Killer Costume! 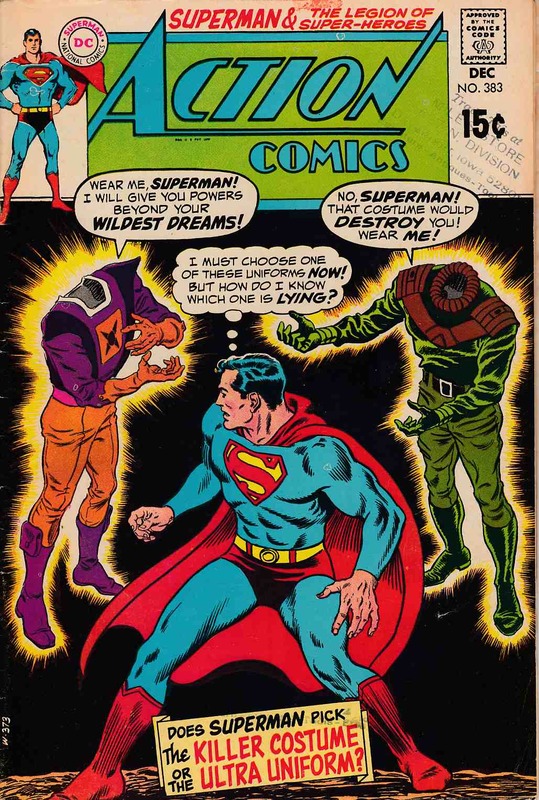 ", script by Cary Bates, pencils by Curt Swan, inks by George Roussos; Aabur-Z is an interplanetary criminal being transported to prison by Enforcer NS-II; Their ship is destroyed but their costumes remain alive due to their willpower and the strange radiation of a comet; Aabur's costume arrives on Earth first and seeks a criminal to possess, but then both costumes are drawn to Superman. Tales of the Legion of Super-Heroes backup, "Chameleon Boy's Secret Identity! ", script by E. Nelson Bridwell, pencils by Win Mortimer, inks by Jack Abel; Chameleon Boy escorts Princess Projectra to a party and meets her friend Janice; Since Janice is repelled by Chameleon Boy's appearance, he disguises himself as Dane to get to know her. *Grading Notes: large store stamps on cover and two interior pages, two extra staples added to book.